I’ve written before about books from my childhood that made some kind of impact on me. One of those books is Edward Ormondroyd’s David and the Phoenix. This book may very well be the first fantasy novel I ever read. I don’t exactly recall where I got it, or why I was attracted to it. Possibly it was one of those books I ordered from the Weekly Reader or obtained from the Bookmobile. I was living in Warwick, Rhode Island at the time, attending Cedar Hill elementary school. And I was utterly fascinated by the book. The appeal, of course, was that the protagonist, David, was a young boy seeking out adventure and finding it. And we all want to believe we can find adventure at that young age. A week or two ago, I was contacted by Marc Tyler Nobleman, an author whose books have been featured in USA Today, and who must have read about my fondness for the book. He was kind enough to point out to me an interview he’d recently done with the author of David and the Phoenix, Edward Ormondroyd. As it turns out, it was the first interview ever for Mr. Ormondroyd. And it is a wonderful interview and even includes some photographs. If you’ve ever read the book, I urge you to go read it. 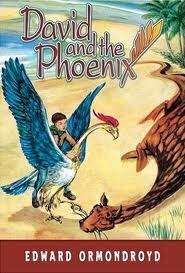 And if you’ve never read David and the Phoenix–or if it has been a long time since you’ve read the book, it is available in a variety of formats on Amazon, including Kindle. It has been a long time since I’ve read the book. More than 30 years. But I am rectifying that right now by reading a chapter or so to the Little Man each night before he goes to bed. He’s younger than I was when I read it, but he seems fascinated. Thanks, of course, to Edward Ormondroyd for writing such a wonderful book. And thanks to Marc Tyler Nobleman for taking the time to call the interview to my attention. Introducing Evernote’s newest “paperless” lifestyle ambassador: Me! Thanks for this, Jamie! Helping bring more about Edward to light has been an honor. This is David Weber’s favorite. So that makes it Honor Harrington’s favorite and, IIRC, she reads it to a child in one of the later books of the series. Thanks to your recommendation, I picked up this book and just finished it. It’s a nice story, although I suspect I would have found it more appealing had I first come across it as a young boy rather than as an adult. That said, the one thing I found a little off-putting, especially knowing how much you like the book, is the attitude of the book toward the scientist who wants to learn more about the phoenix. This also seems odd when taken along with the phoenix’s desire to give David an education. Anyway, I do thank you for the recommendation. It is a most diverting tale.